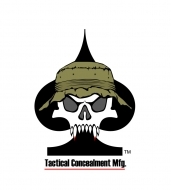 Tactical Concealment is a defense manufacturer that designs and produces specialized sniper apparel and other camouflage/concealment oriented products for military and law enforcement use. Tactical Concealment produces base foundation products for which the end-user will add thier camouflage upon to, as specific to thier area of operation. Founded by Michael D. Stanchik in 1999 Tactical Concealment has grown from an “out of the home garage” work environment into a commercially equipped operation capable of meeting large volume production demands. All sewn goods are Berry Admendment compliant and manufacturing is performed under one roof in it's Tempe Arizona production facility. Tactical Concealment clients are made up of the most advanced military and special operation professionals in the world. Advancements in innovation and quality keep Tactical Concealment on the cutting edge of current and future warfare. Email me jobs from Tactical Concealment Corp.